The French Quarter is known as one of the most haunted places in America, and with so many ghost tours to choose from, the best choice is this 1-hour carriage tour from the award-winning Royal Carriages, recently awarded the 2018 Louisiana Attraction of the Year Award. 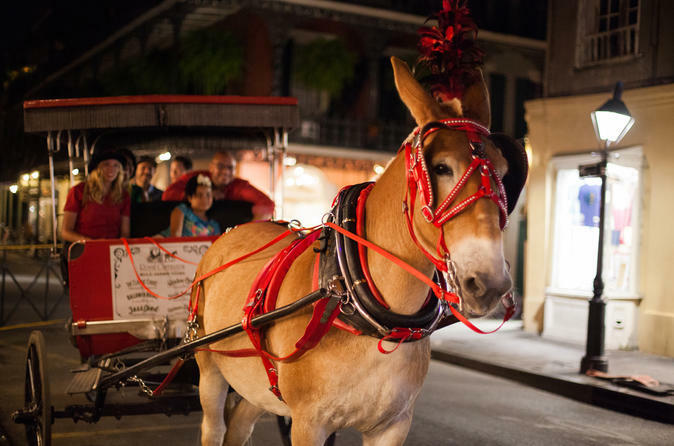 Instead of walking around with a large group of people, you'll travel to and from haunted locations comfortably in a mule-drawn carriage guided by a professional tour. Learn about all the history, culture, and architecture in addition to the ghostly spirits that refuse to leave. This authentic mode of transportation will help you time-travel back to the 1700s and 1800s when death and disease were rampant due to devastating fires, floods, murders, and more! Being that there are only 8-passengers on-board the carriage, the mule-drawn adventure is more intimate and unforgettable. The carriage-driving tour guides are top-rated licensed guides who have been sending chills down spines for over 75 years. Meet and board at the carriage stand located at 700 Decatur Street. As your carriage departs from Jackson Square, your driver/guide will regale you with stories of the city's founding as the carriage passes through the historic French Quarter streets, past landmarks such as Saint Louis Cathedral, Jackson Square, Napoleon House, and more as the carriage wind through New Orleans oldest neighborhood. Expect stories that are both historical, entertaining and appropriate for all visitors. It's important to understand the history so that you can understand the spirits that haunt the buildings. New Orleans is considered to be the most haunted city in America. Countless tragedies have happened right in the French Quarter, including devastating floods and fires killing thousands, contagious epidemics resulting in thousands of deaths, and other odd occurrences like weird human torture experiments, medical experiments, love lost, and more. These stories have been documented in police records and history books, and some can be quite alarming! You'll learn about the stories, then about how the "spirits" are letting people know that they are still very present! Do you have goosebumps yet? Are you a fan of American Horror Story? If so, you will absolutely see the infamous LaLaurie Murder Mansion, and discover how the true story told on TV is both similar and different from what actually happened inside this house of horrors. After your 1-hour roam through the French Quarter at night, return back to Jackson Square.